Let’s get Halloween-ey!! I loved Teen Witch well before I was even a pre-teen, but I recently felt the need to see it again. It’s still so relevant! Here is why my younger millenial friends should watch it: Imagine every 80’s teen movie meets Grease and Mean Girls with a sprinkling of Hocus Pocus. ♠The mom is superhot, the dad is not. But they are both nerdy in typical 80s sitcom-couple style. ♠Special sightings of people playing high school students that may now be dead, like Lara Flynn Boyle. 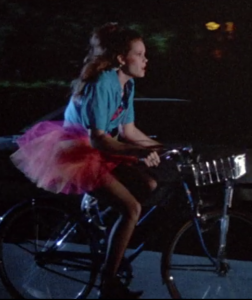 ♠The big hair, the pink parade, the tutu tulle mini skirts. Bring me back! I was just starting school then, but I had similar outfits by the time I hit first grade and the pictures to prove it. ♠Like every teen movie that ends at prom, but the hairah, the hairah! Yes, kids, this really is an awesome flick. If you can’t find it, watch it at my house as you nurse your hangover after #Halloween2015.